We are calling for volunteers to take part in a new clinical trial that may help people with schizophrenia. Many people with schizophrenia have residual symptoms in spite of treatment with antipsychotic medication. Auditory hallucinations (‘hearing voices’) are a symptom that is treatment-resistant in 25 to 30% of patients, and cause distress.A novel technique which has a benign safety profile and which allows the simultaneous stimulation and inhibition of multiple brain regions offers promise for people suffering cognitive problems and hallucinations. With transcranial direct current stimulation (tDCS), very weak electrical currents are applied to the brain via electrodes on the scalp. In a typical setup, positive electrodes are used to enhance excitability of the underlying cortex, and negative electrodes are used to reduce excitability. TDCS has been shown to produce beneficial effects on cognition when a positive electrode is applied to an area overlying the prefrontal cortex. Our lab has also shown that it may be beneficial in some people with schizophrenia. 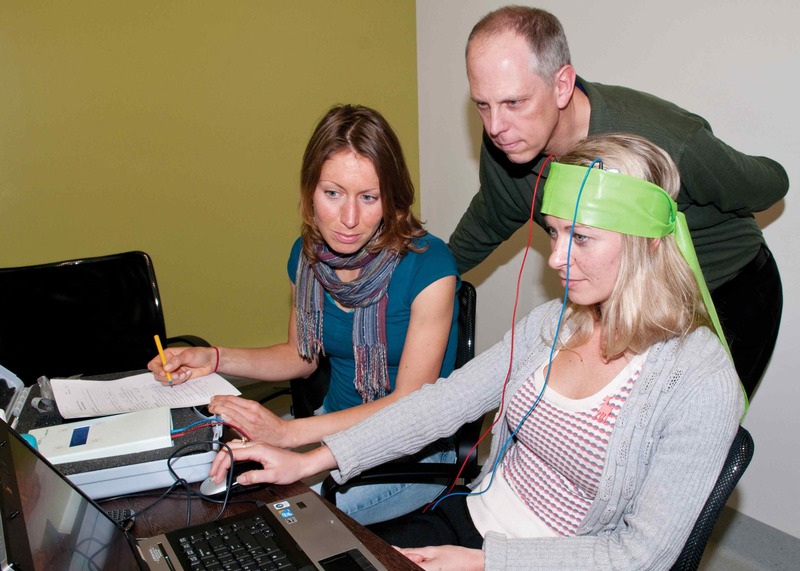 Dr Ans Vercammen and Dr Tom Weickert monitor a participant having tDCS therapy. We are currently investigating whether a combined approach of positive prefrontal and negative temporal tDCS may enhance cognition and relieve auditory hallucinations. Participants will receive 20 minutes of brain stimulation 5 days a week, while performing a working memory task. Participants receive an MRI, as well as a comprehensive assessment of cognition and symptom severity prior to and following 4 weeks of tDCS treatment. If you want to be a part of this trial please contact schizophreniatreatment@neura.edu.au or Dr Thomas Weickert on 02 9399 1130. Dr Ans Vercammen is a research officer with the Weickert Group at NeuRA and an expert in the cognitive and neural basis of auditory-verbal hallucinations in schizophrenia.